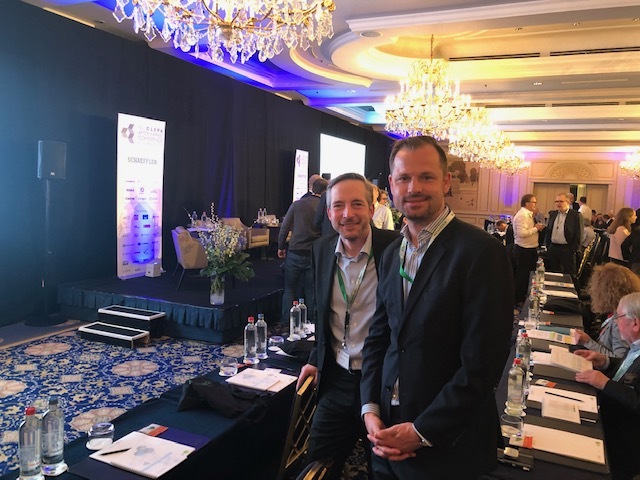 CEO Sven Krüger, and Patrick Schulte-Loh, Head of Sales and Marketing Automotive discussed megatrends in the automotive aftermarket at the leading industry meeting of the European Association of Automotive Suppliers in Brussels. The 10th Aftermarket Conference took place from 27th to 28th March 2019 at the Steigenberger Wiltcher’s Hotel in Brussels, in the year of the 60th anniversary of CLEPA, the European Association of Automotive Suppliers. Under the theme “Ability to lead in a digitalising environment”, top speakers from industry, European institutions and service providers gave fresh impetus on the latest trends in the areas aftermarket and mobility platforms. The high-level and diverse audience discussed the future challenges of the automotive industry in a digital world. As a global system provider of market information and data-based solutions in the automotive aftermarket, Eucon presented one of the leading industry solutions for efficient product management. As part of the conference, Schaeffler, Continental and Caruso Dataplace jointly gave an insight into the future of repair workshops in a connected world. The shared use of vehicle telematics data via a digital marketplace enables optimized logistics and repair processes and increases customer satisfaction and loyalty. “As trailblazers for data and process intelligence, we were able to identify interesting solutions and delivered convincing services that help identify potential for added value and improve competitiveness and processes,” explains Patrick Schulte-Loh. If you are looking for further information, please do not hesitate to contact us.